This article was meant to be a celebration. It was conceptualized last week when many of us thought the United States was on the cusp of electing its first female president. We at The Tartan expected to be releasing this issue in the afterglow of Hillary Clinton’s success, and we wanted to use that success to call for even more progress, namely, an increase in the number of women serving in the president’s Cabinet. After the startling upset Tuesday night where Donald Trump was elected as the next president of the United States, there isn’t as much to celebrate. Trump’s victory can hardly be called a victory for feminism. Still, even under President Trump, there is potentially room for progress. The first woman appointed to the U.S. Cabinet was Frances Perkins, who served as Secretary of Labor from 1933 to 1945 under President Franklin Roosevelt and for a few months under President Harry Truman. After Perkins’ appointment it was two more decades before another woman was appointed to the Cabinet, this time Oveta Culp Hobby as Secretary of Health, Education, and Welfare. This set the pace for the slow, plodding progress women have made in this portion of the political sphere. Female representation in the Cabinet peaked in the 1990s when President Bill Clinton appointed nine women as part of his Cabinet for his second term. Still, this only meant that 41 percent of the Cabinet was female, falling far short of the female share of the general population. Since Clinton’s presidency, the progress has stalled, with women only making up 19 percent of President George W. Bush’s first Cabinet and inching up to 35 percent in President Barack Obama’s current term. This negative trend isn’t very promising for women trying to reach gender parity in the Cabinet any time soon. Clearly, women are underrepresented in politics in general, and in the Cabinet specifically. But why does this matter? When Canadian Prime Minister Justin Trudeau was asked why he thought it was important to appoint a Cabinet that was 50 percent women at the start of his term, he responded, “Because it’s 2015.” Trudeau’s decision to prioritize gender parity in his appointments was controversial, with some people claiming that it would require him to make incompetent appointments. This statement assumes that there are no, or significantly fewer, women qualified for cabinet positions. Usually, people appointed to cabinet positions come from a background in politics, academia, or law. In the U.S, women made up 53.3 percent of people with Ph.Ds as of 2010. As of May of this year women made up 36 percent of the legal profession.. There are well-educated, qualified women out there who are being passed over due to our country’s legacy of sexism. Having gender parity in political bodies can have huge positive effects for a nation. Without adequate representation, women are sidelined in the political sphere, with their voices only being heard through the filter of a male representative. Women have different experiences that tend to emphasize different priorities, and, according to Time Magazine, countries with a representative gender distribution in their lawmakers tend to make more progress on issues such as education, labor-force participation, and paid leave. Gender parity can also improve trust in government, something the U.S. is currently lacking, with surveys finding that both men and women view political institutions as more fair, legitimate, and democratic when women are proportionally represented. Finally, putting women in positions of power can shift public perceptions of women in leadership, improving gender equality across the board. Making significant strides in one administration can have lasting effects. In 1986, the first female prime minister of Norway, Gro Harlem Bruntdland, appointed a government that was 40 percent women. To this day the government still reflects gender parity, and women are now required by law to make up at least 40 percent of corporate boardrooms in Norway. The Cabinet is a particularly good place to push for women’s representation because it consists of appointed positions. Elected bodies in the U.S. are notorious for being male-dominated. This happens for several reasons. First off, fewer women tend to run for office or even consider running. Our society doesn’t tend to encourage women to run or to think of themselves as political leaders. Even once they decide to run, women tend to face an uphill battle against stereotypes and gender-based double standards that have been discussed before in these pages. These barriers make it very difficult for women to make progress in elected positions, and are why women made up only 19.4 percent of Congress in 2015. In contrast, gender parity in the Cabinet only requires one person to realize the importance of female representation, and once women are in Cabinet positions they can start to break down some of the double standards surrounding women in power. With a new administration coming into power in January, a new Cabinet will have to be appointed along with it. Trump has an opportunity to make a lasting positive change with his appointments. However, only four of the Cabinet positions even have women on his “short list” for the job, and of those it is unlikely that all four will go to female candidates. 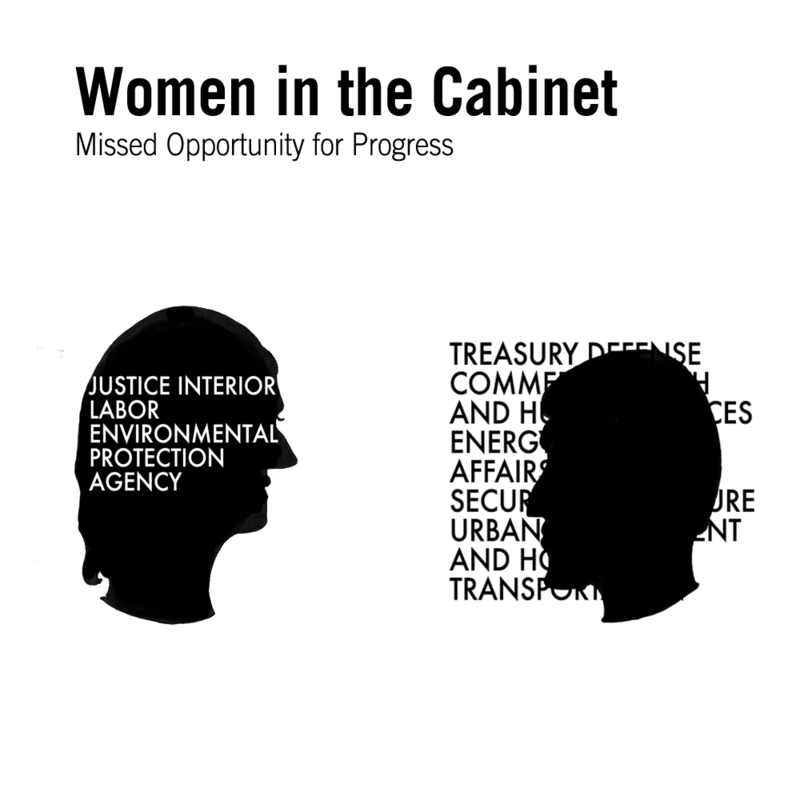 Even if all four positions were filled by women, Trump’s proposed cabinet would only be 17 percent women, a level that hasn’t been seen since President Jimmy Carter left office in 1981. This would be an unacceptable setback for gender parity, and something we the people must fight to remedy before the Cabinet is set in stone.